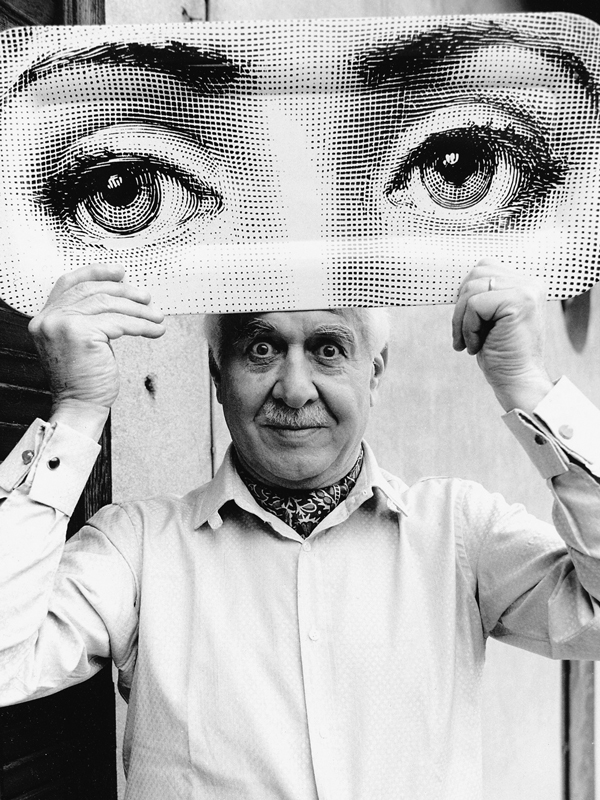 Piero Fornasetti was born in Milan in 1913 and he grew up with an insatiable desire to draw anything and everything. He won a seat at the Accademia di Belle Arti di Brera in Milan, but was promptly expelled; his creative spirit did not match the harsh discipline of the academy. He forayed into the realm of fashion and began designing silk scarves with his soon-to-be signature motifs of roman ruins, suns, and flowers. In his furniture designs, Fornasetti worked in an incredible range of materials to create a dizzying array of decorative arts imbued with both wit and theatricality. Struck with the beauty of the famed Italian opera star Lina Cavalieri, Fornasetti created an entire series called “Themes and Variations” with more than 300 versions of Cavalieri’s face. With tongue in cheek irony, Fornasetti depicted Cavalieri in a variety of guises ranging from the humorous to the surreal. In 1959, Fornasetti won the Neiman Marcus award for his significant contributions to the field of fashion, joining the ranks of Yves Saint Laurent and Coco Chanel. Fornasetti died in 1988, leaving behind thousands of imaginative designs and forever changing the field of Italian decorative arts.